The Small Business Association (SBA) closed their festive week with an elegant awards ceremony celebrating the achievements of small enterprises on Saturday night. At an awards ceremony at the Radisson Aquatica Resort that featured music by Ruk-A-Tuk, the biggest winners were Neil Corbin, managing director of NPURE, a subsidiary of The Telephone Repair Inc., who claimed the President’s Award and managing director of Atlantic Seafoods Inc. Dave Waithe who won both the People’s Choice Award and the title of Small Business of the Year. The SBA’s outgoing president, Dalton Medford, commended the association for what it had accomplished during his four-year term. Exploring the next steps for the association, he suggested a co-op be created once government’s proposed $50 million Small Business Development Fund becomes accessible. President of the Small Business Association Dalton Medford. That fund is expected to be available from January 1, 2017, Minister of Industry, International Business, Commerce and Small Business Development, Donville Inniss announced earlier this month. “A system must be put in place to ensure that the fund is sustainable and viable for the sector. The money will go into the co-op and lent to businesses at a favourable interest rate to encourage repayment, to replenish the co-op, so that other businesses can benefit,” Medford said. He added that the co-op must have a clear mandate to distribute funds for local investment that will lead to export. “If we have a strong SME local sector, with the right incentive, it will lead to our business people having the confidence to export,” Medford said. He added that the SBA must also continue to push for a government procurement policy that would see small businesses getting a quota of government contracts. Managing Director of Atlantic Seafoods Inc won both the People’s Choice Award and the Small Business of the Year Award. 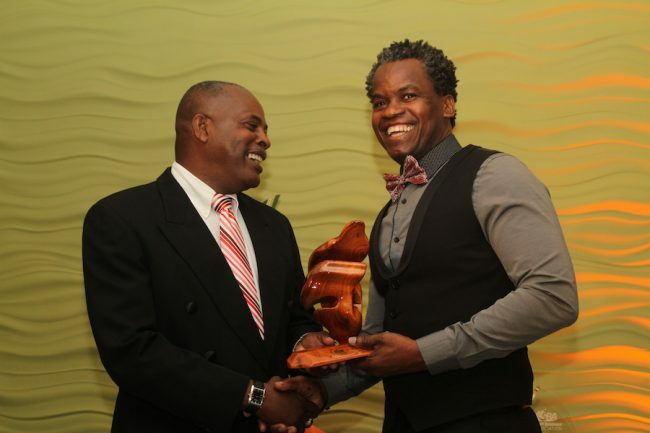 Managing Director fo Sentry Insurance Brokers Ltd Stephen Ollivierre with his sectoral award for general business. Managing Director of NPURE Neil Corbin copped the President’s Award. Great initiative from these guys! wishing them all continuous success. Here now are parts of good products distribution, and supply quotas; it must be transportation and marketing. A reliable and safe air cargo system which can deliver our manufacturing and produce inter-regional and internationally on a timely basis.